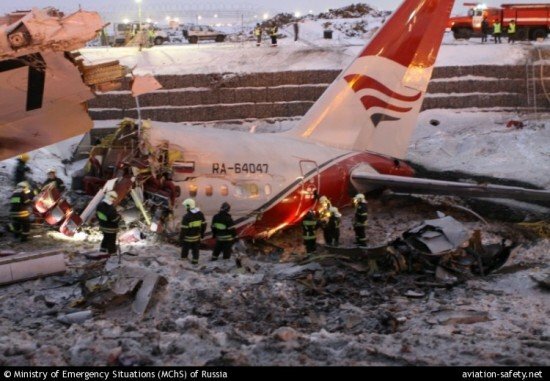 The Russian Federal Air Transport Agency announced unscheduled inspections of Red Wings Airlines, the airline involved in a fatal runway excursion accident involving a Tupolev 204 at Moscow’s Vnukovo Airport in December 2012. The Federal Air Transport Agency ‘Rosaviatsia’ said in a statement that they would conduct an unscheduled inspection of the airline to see if it still meets the certification requirements of flight and technical operation. Meanwhile the Interstate Aviation Committee reported that they were continuing their work on the analysis of the flight data and cockpit voice recordings, as well as inspection of the air brakes, spoilers, reversers and brakes of the accident airplane. Data was also obtained on an incident on December 20, 2012 when a Tu-204 suffered reverser problems on landing at Novosibirsk.